Visitors observe alewives congregating in the historic Damariscotta Mills fish ladder that is undergoing restoration in Nobleboro, Maine. In the spring of 2012 more than 400,000 alewives passed through the ladder, located about sixteen miles inland from the Gulf of Maine, on their annual spawning migration to Damariscotta Lake. Feeding primarily on the tiny invertebrate organisms known as zooplankton, alewives seldom grow more than twelve inches long at ma­turity, which males generally reach at age four and females at age five. What they lack in size they make up in numbers. Adults and juveniles are eaten by almost every living creature that shares their environment. In the sea, they are an important part of the prey base for resident groundfish (fish that live on, in, or near the bot­tom) such as cod and haddock, as well as for transient migrants such as striped bass, bluefish, and tuna. They are pursued by marine mammals, including seals, dolphins, porpoises, and whales. 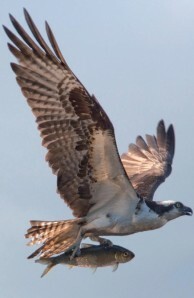 In their spring migra­tions into rivers to spawn, the mature adults are eaten by gulls, ospreys, and eagles. The juveniles migrating out to the ocean in the summer and fall are consumed by resident fish, birds, and mammals. River herring enter rivers to spawn on a time gradient from March in the southern part of the range to June in Canada. Alewives typically are the first to arrive, followed by blueback herring and American shad. From the earliest colonial times, alewives have been economically important. 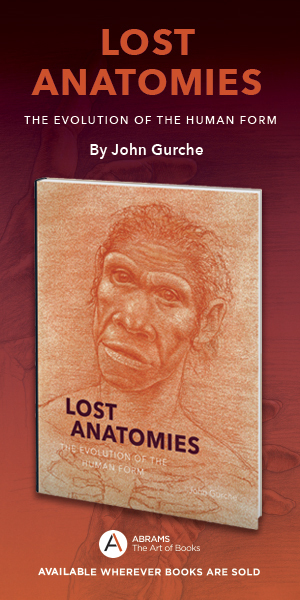 With their high fat content, their arrival when other food stocks were low made them valuable as a food source, eaten fresh or salted and smoked. In New England, many coastal communities provided free alewives to their poor or elderly citizens. There was a flourishing trade in smoked salted alewives sent to the West Indies to feed the slave populations of the “sugar islands” of the Caribbean. In Maine, alewives are widely used as lobster bait, particularly in the spring when other bait supplies are low. 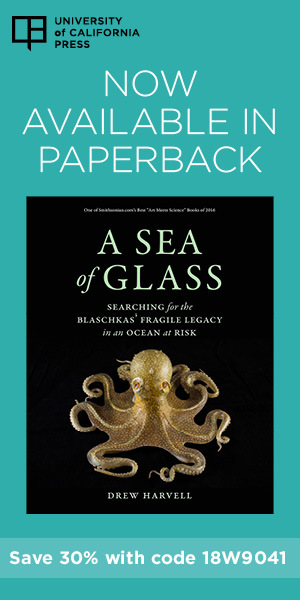 But from Colonial times to the present day, the biological riches of the Atlantic seaboard have been under assault through overfishing on marine and anadromous stocks, the erection of dams without fish passage, and pollution from the dis­charge of municipal and industrial wastes. None of those problems went unnoticed. There are numerous re­cords documenting the loss of anadromous fisheries, dating back almost 300 years. Hundreds of petitions were made to governing authorities setting forth the dismay and outrage of citizens at the wanton destruction of resources upon which they were dependent for a livelihood. Yet by and large, preventing the losses received only lip service. The frontier mentality that a resource lost in one location might yet be found just over the horizon pervad­ed the eighteenth, nineteenth, and early twentieth centuries. Foresight­ed people failed to stem the tide be­cause of lack of public support and a mindset that considered resource de­struction in the name of “progress” to be inevitable and acceptable. By the middle of the twentieth century, most anadromous fish runs in the rivers flowing to the Atlantic Ocean had been wiped out. Many groundfish stocks, such as cod and haddock, were reduced from overfishing and from the loss of the forage base furnished by juvenile anadromous fish. After the end of World War II in 1945, things began to change. The United States had become the world’s greatest industrial power. An era of prosperity set in. At the same time, it was increasingly clear that the price of prosperity in terms of harm to water, air, wildlife, and human health was high and growing higher. In the decades between 1950 and 1980, great strides were made toward understanding the collateral consequences of industrialization and establishing a framework to address them. At the federal level, the National Marine Fisheries Service (NMFS), part of the National Oceanic and Atmospheric Administration in the Department of Commerce, was charged with management of the nation’s coastal and offshore waters and the species that inhabit them. It was given the legal tools and funding to start restoration of lost or depleted marine and anadromous fishery resources. The federal restoration of anadromous fisheries was specifically mandated by the Anadromous Fish Conservation Act of 1965. States were encouraged to develop the political structure to deal with fishery issues, in the belief that operating within the overall framework of federal legislation, each state could best identify its own needs and could best develop the processes appropriate for dealing with its own fish stocks. Significant federal funds were made available to that end. Each state has an agency responsible for setting and enforcing the regulations necessary to manage fisheries in its coastal waters. The Atlantic States Marine Fisheries Council plays a coordinating role between the federal agencies and the states. Fishery managers have learned to think in terms of ecosystem management rather than single species management, because, as John Muir pointed out more than a century ago, “When we try to pick out anything by itself, we find it hitched to everything else in the Universe.” For one thing, restoration of depleted groundfish and migratory fish populations is dependent upon an adequate forage base for the species, available either year round or seasonally. Alewives are a major part of the underpinning for marine and freshwater ecosystems. 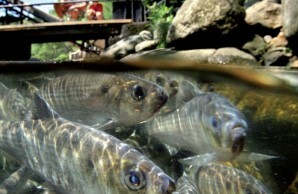 Another critical role for alewives is as a buffer for other species against predation. As an example, it is no coincidence that juvenile Atlantic salmon (known as smolts) migrate downriver to the sea at the same time that adult alewives migrate upriver to spawn. Since there are many more alewives than smolts, any given Atlantic salmon smolt has a better chance of avoiding being eaten by a hungry osprey, cormorant, or seal than it would have if migrating in isolation. So those people who are in charge of restoring Atlantic salmon are also busily restoring alewives. Unfortunately, despite more than forty years of effort, alewife populations from southern New England to the Carolinas remain severely depleted. In Canada, the federal agency Fisheries and Oceans Canada (DFO) has documented similar declines of alewives in the Maritime Provinces. Many states from Massachusetts to North Carolina have imposed moratoriums on the harvest of alewives. The NMFS listed alewives as a “Species of Concern” in 2006. And last year, a petition was filed by the Natural Resources Defense Council seeking listing of alewives as a threatened species under the federal Endangered Species Act. The Maine Department of Marine Resources (DMR) has been working at restoring alewife populations for more than forty years. Even so, the restoration program has had its share of controversy. Although alewives are a native species, they are seen in some quarters as undesirable intruders. There is no better example of this conflict than the St. Croix River, which forms the boundary between the United States and Canada. That river has the potential to host the return migration of up to 25 million spawning alewives. In 1985, as the result of DMR efforts, 2.5 million fish were entering the system. Then a raging controversy arose because certain local angling guides who favor nonnative smallmouth bass thought that alewives were responsible for a population crash of bass. In fact, a series of dry years and massive drawdowns (for hydroelectric power generation) of impounded lake waters along the St. Croix destroyed shallow-water bass spawning beds. But it was easier to accuse alewives than to take on a major economic force in the region. Alewives were called evil predators, even likened to piranhas, in testimony and debate within the Maine legislature, despite the fact that they are plankton eaters. 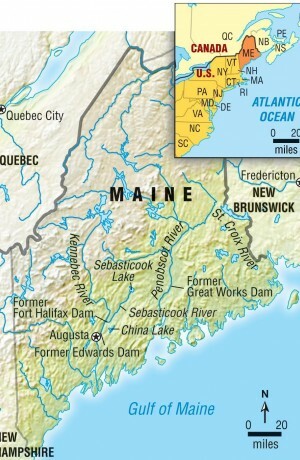 In 1995—over the opposition of state and federal fishery managers, the Canadian federal government, and the New Brunswick provincial government—the Maine legislature enacted a statute barring alewives from access to the fish passage facilities at the two lowest dams on the St. Croix River. 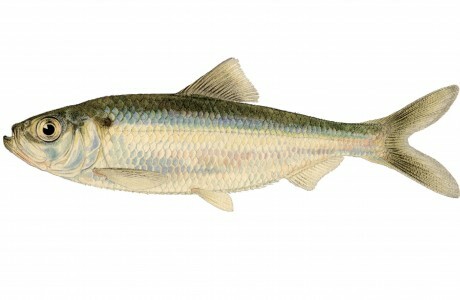 In 2007, Maine Rivers, an independent advocacy organization, issued a study of the interaction between alewives and smallmouth bass that showed definitively that plankton-eating alewives are not detrimental to piscivorous smallmouth bass at any life stage, and in fact all life stages of smallmouth bass thrive on a diet of alewives. The following year the statute was amended to allow access through the lower of the two dams, but the small area to which alewives were granted access is low-quality habitat and amounts to only about 2 percent of their historic range in the St. Croix system. The result has been a population crash; in some years fewer than 1,000 fish returned. Meanwhile, from 2001 to 2007, the Canadian DFO resorted to trapping alewives below the dams and trucking them upriver. That is probably the reason that there are any alewives in the system at all. The battle to restore alewives to the St. Croix has raged in the Maine legislature and before the International Joint Commission created by the 1909 Boundary Waters Treaty between the United States and Canada, and it continues in the courts. A recent filing by the Conservation Law Foundation in the United States District Court for the District of Maine asserts that the exclusion of native alewives from their natural habitat is a violation of the Federal Clean Water Act. In latebreaking news, on July 10, in a landmark letter to the Attorney General of Maine, the Environmental Protection Agency’s Office of Ecosystem Protection agreed, finding that the artificial exclusion of alewives, a native species, has indeed “caused the habitat to be degraded.” Since there is no known “sound scientific rationale” for such exclusion, the EPA instructed Maine authorities to “take appropriate action to authorize passage of river herring” farther up the St. Croix. The next move is Maine’s. In other areas, the state of Maine has already experienced the benefits of alewife restoration, overcoming the irrational prejudice against the river herring. Many Maine lakes suffer from summertime algal blooms, making them unattractive to cottage owners. The real cause of these blooms is lack of proper sewage disposal systems and the fertilizing of lawns too close to the water, resulting in too much phosphorus in the lakes, and consequent eutrophication. Because adult alewives bring in a certain amount of “marine-derived nutrients” to the lakes, many lake associations have accused alewives of being the cause of algal blooms, and many water districts using lakes as their water source have opposed alewife restoration for the same reason. Fortunately, recent studies have shown that in fact juvenile alewives are net exporters of phosphorus out of the lakes. At Sebasticook Lake in the Kennebec River drainage, a lake long notorious for algae, blooms have sharply diminished in recent years following alewife introductions. The Kennebec Water District, which draws drinking water from China Lake, has recently reversed its position and is actively supporting alewife restoration in that lake. Nevertheless, old habits die hard, and there are still those to whom alewife restoration is anathema. There have been successes in Maine rivers as well. The removal of the Edwards Dam from the Kennebec River in 1999, followed a decade later by removal of the Fort Halifax Dam at the mouth of the Sebasticook River, a major tributary, has led to the rejuvenation of the anadromous fisheries of that system, including alewives and shad. The Kennebec River currently has the largest run of alewives on the eastern seaboard, estimated at more than 3 million fish in 2012, with the potential to triple that number when alewives gain access to all the lakes that constituted their historic habitat. 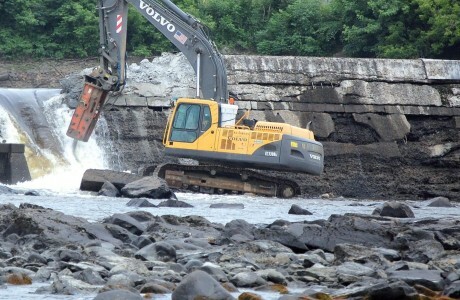 The Great Works Dam, one of two lower dams being dismantled on the Penobscot River, was breached on June 23, 2012. It was a milestone moment in the Penobscot River Restoration Project, a comprehensive effort to open up habitat for alewives and other anadromous fish (those that migrate to and from the sea) while maintaining or even increasing hydropower production. At the Penobscot River, the restoration of eleven species of anadromous fish, including Atlantic salmon, shad, alewives, and sturgeon, is the goal of removal of two dams in the lower river. This unique $60 million project is supported by the Penobscot River Restoration Trust, a consortium comprising American Rivers, the Atlantic Salmon Federation, Maine Audubon, the Natural Resources Council of Maine, The Nature Conservancy, Trout Unlimited, and the Penobscot Indian Nation, as well as DMR, NMFS, and the U.S. Fish and Wildlife Service and other partners. It will open up more than 1,000 miles of river habitat. It is thought that several million alewives will return to spawn when the project reaches its full potential. The Great Works Dam, one of two dams being dismantled, was breached on June 23, 2012. In addition, there are dozens of smaller Maine coastal river systems that have existing alewife runs or the potential for future runs. Many Maine communities have retained the right, dating back to colonial times, to license the harvesting of alewives in the rivers that pass through them. The thousands of dollars the licenses bring in annually go to support the municipal governments. Other river communities are looking at the potential for licensing fees when alewife runs increase to the point where local harvest is environmentally and economically sound. Every dollar raised from licensing alewife harvest is a dollar that does not need to be raised by taxation. Once Maine’s river systems achieve their full potential for alewife production, spawning runs are expected to be in the range of 50 million fish annually. It has been estimated that each spawning female can produce as many as 1,000 juvenile alewives that survive to migrate to the sea (and surviving adults may return to spawn for several years). That translates into 50 billion fish added to the marine forage base. Only two in 1,000 need to survive to spawn in order to maintain a self-sustaining run. The other 998 are available to be eaten by groundfish and migratory fish species, birds, marine mammals, and other predators. It is this extreme fecundity that makes the alewife such an important component of the forage base for all the creatures that depend upon it for their own continued existence. The result of reestablishing alewives and the commercial ground fisheries of the Gulf of Maine will be the revitalization of currently impoverished coastal communities and the recovery of a way of life deeply rooted in history. Today only a shrunken population of commercial fishermen eke out a difficult living while facing a mind-numbing set of rules that limit their number of days at sea, types of gear, and the timing and location of their efforts. That could change with the restoration of a viable commercial groundfish industry. In that regard, the tiny alewife can play not only an important biological role, but a sociological and economic one as well.